The word granola was brought to everyone's attention in the late 60s - the hippy era. It is funny when you think about it; nutrition-conscious thoughts in the midst of the drug culture and its loose lifestyles! Thank goodness most of us were more mainstream and on the look out for healthy food choices. As people experimented, granola evolved into bars and cereal, toppings for ice cream and yogurt and trail mixes. 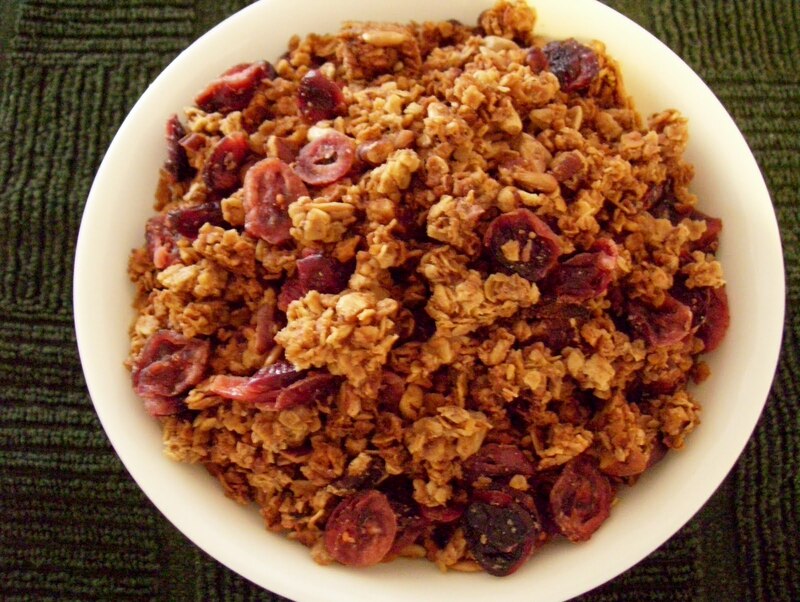 Most of us were led to believe granola was not only healthful, but also a lo-calorie way to eat. Unfortunately, a lot of commercial granolas were and are high in sugar and fat. Many do not have any real food value - they are fat and carbs. One small bar can have over 130 calories! Homemade granola is not difficult to make and the ingredients can be selected for one's individual taste. This recipe is not high in sugar and fast; feel free to substitute seeds, nuts or dried fruit of your choice in this easy recipe. Preheat oven 325 degrees. Place first 5 ingredients in a bowl and stir to combine. Place oil, syrup and 1/4 C water in a small bowl. Whisk to combine. Pour oil mixture over the oat mixture and stir. Spread the granola on a rimmed baking sheet. Bake until it begins to brown, about 25 minutes. Stir well with a spatula. Continue to bake until golder, dry and fragrant or about 20-25 minutes longer. Stir at least once during the second baking process. Watch closely during the last minutes so it does not burn. Cool granoal on a rack. After it is cooled, add cranberries. Transfer to an airtight container. It can be stored at room temperature for up to a month or frozen for up to 3 months. (Recipe may be doubled). Note: The cranberries, orange peel, seeds and nuts are all nutrition-worthy. Marian wrote: Diane, you have several times referred to Trader Joe's products. Are they all together in a separate display, or are they scattered around the store in the various departments? I had never heard of them, but then I mostly "shop the periphery" of grocery stores. Trader Joe's is a special grocery store that features fresh and frozen organic foods and other products like sauces, bread, nuts and dried fruit,dozens of different kinds of cheese,beverages and soups to name a few. Many of the items in the store are sold under a house label and seem to be sold only in their stores. Trader Joe's has a huge following of consumers who love the products and the marketing concept.